Welcome to Kata View Guesthouse, a family owned guesthouse that gives you warm and cozy atmosphere where located only 450 meters from Kata; one of the most famous and beautiful beach in Phuket. There are plenty of entertainments and shopping marts nearby the area. Here offering ‘Family Room with balcony’ where you can have a precious time with your family and so many choices of room types and lots of family services style for you. 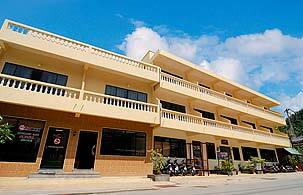 Additionally, Kata View Guesthouse provides you with many services; room service, internet cafe, laundry and so much more. If you would like to travel around the island, do not hesitate to buy a tour tickets and rent a car from here. This is such a place you will want nothing more! If you just like to spend your lazy day relaxing in your room, do not forget to order some dainty food from its restaurant. With lovely and friendly Thai staff services, you will remember the unforgettable memories even you go back to your own home! Let Kata View Guesthouse enhances your experiences.